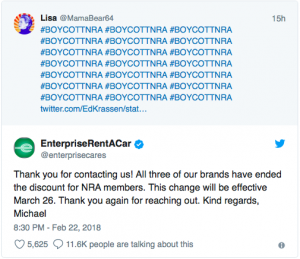 Enterprise Holdings, one of the world’s largest car rental companies, announced Thursday that it will end its discount promotion for National Rifle Association members. The car rental company, which operates Enterprise, Alamo, and National, announced on Twitter that all three of their brands have ended the partnership with the NRA effective March 26. The announcement by Enterprise comes at a time when the NRA is facing backlash in the wake of the Stoneman Douglas High School shooting that left 17 children and teachers dead last week, according to Business Insider. The Feb. 14 shooting has increased pressure on state and federal lawmakers to work toward gun-control reform, with a vocal group of students from the Parkland, Fla. high school calling for a ban on the AR-15, the gun used by the shooter.